MANILA, Philippines- Described as shy but hardworking, Ricardo Cruz, 11, is probably the youngest fire volunteer in the country. The pint-sized fire volunteer is an inspiration to the youth. 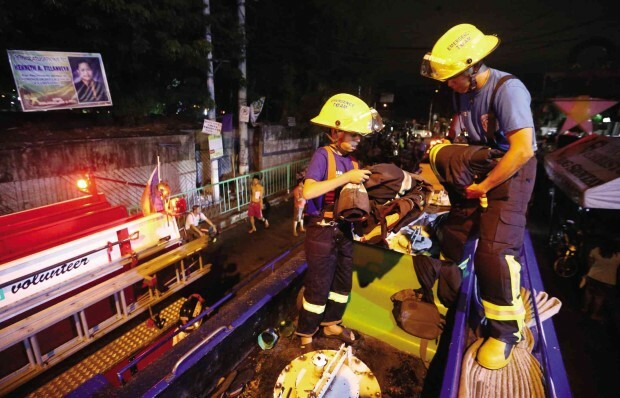 Although he does not participate in actual firefighting, the pint-sized member of Pasig Alliance Volunteer Group (PAVG), helps fellow fire volunteers keep their gears and quarters in order and ensures that the fire truck is in good working condition. Situated on top of fire truck, the young firefighter looks after the gear and equipment of the firemen when his comrades are in action. “Banny” to his family and friends, Cruz is the 10th child in a brood of 11. In the past, he would tag along with his older brother Bobby, a barangay watchman in their area. An out-of-school youth who often encountered members of the PAVG, Banny would often tell the group that he would like to join them. After realizing that Cruz was serious and that it would be less risky for the child to join them instead of the watchmen, De Lima invited him to join their new headquarters on Kamagong street. Cruz, who has been a volunteer for four months, sorts hoses, assists in cleaning the quarters and helps clean the firetruck. Although he does not receive salary, the group covers his basic needs. At a young age, Cruz is able to help his widowed mother, who washes clothes and drives a tricycle in order to make ends meet. “We hope that Banny will serve as an inspiration to kids and out-of-school youth; to those who have strayed off the right path and become a burden to their parents. Banny may be an out-of-school youth but he has already contributed a lot to society,” De Lima told Inquirer.